On the night of December 31, 2010 I sat at The Bachelor Palace alone…except for Rocco….gently weeping and asking God to send me somebody to relieve the loneliness & lift the gloom. I’ve never told anyone that, and I’m not sure why I have decided to be so revelatory now. Maybe I have finally realized I have nothing at all to lose. It is certainly not to elicit any level of sympathy, but more to illustrate a point. One year later I did not reach quite the same level of despair, although it was tempting since God had not yet answered my plea. I’ve set aside the emotion and become more contemplative, not only of my situation, but also about the world at large and this thing we call a “new” year. I have grown to detest New Year’s Eve. There are two kinds of people to whom the event is targeted. The first type is the party animal. We all know these individuals. Some of us have been these individuals. They will happily use any excuse to “go out” and “party”, usually consuming copious amounts of alcohol in the process. Please understand that I am not being critical. Like I said, once upon a time I fit into this category like a glove. Sometimes I wish that I was still a party animal because life would be a lot more fun and much less solitary. The lifestyle of the party animal is also perfect for New Year’s Eve because their charismatic aura usually means they have lots of friends so their phone rings off the hook with invitations to all manner of social gatherings. The second target audience of New Year’s Eve are couples. Whether they are still trying to hang with the 20-somethings at the bar or have evolved into attending a fun little get together with friends complete with finger food and board games, it’s all about being with the one you love…or loving the one you’re with (Where are Crosby, Stills, & Nash when we need them??). And then of course those couples eventually have children so even if they stay in they’re usually doing something fun. Unfortunately for me I am Choice C…none of the above. I’m single, have no children, don’t really drink or “party”, and even though I feel like I’m a nice person my phone n-e-v-e-r rings and I am never invited to or included in anything. I’m the person that will someday die alone in my apartment and no one will notice for several days until the stench becomes overwhelming. I am invisible and disconnected from society, which to some degree is probably my own fault but is largely a mystery…atleast it is to me. To be honest this relative anonymity doesn’t really bother me most of the time. But on New Year’s Eve it is gut wrenching. I’m not sure why kissing someone at midnight is a tradition…I just know that it is depressing not to have anyone to kiss. Now once we get past that whole New Year’s Eve thing I’m okay, but I still find the concept of a new year intriguing. After all, January 1st is just some arbitrary day that was decided upon a couple thousand years ago by the Romans. January is named for Janus, the Roman god of gates, doors, and beginnings, of beginnings & endings and transitions. 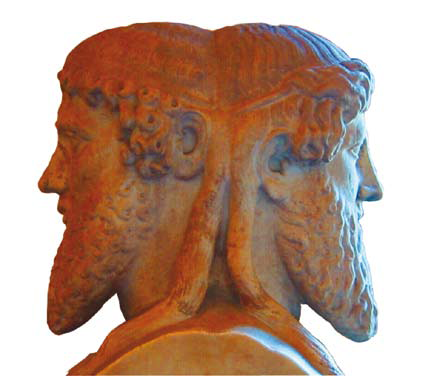 Janus supposedly had two faces…one looking forward and one looking back. Mythology is undoubtedly fascinating, and this story in particular is kind of cool. But let’s be honest…there is usually not one bit of difference between 11:59pm on December 31st and 12:01am on January 1st. There isn’t some bolt of lightning that shoots down from the heavens erasing all our worries, mistakes, & illnesses and magically making our lives perfect. But we do tend to gravitate toward that notion, imagining that magical bolt of cleansing lightning to be real. Human beings love the idea of redemption. We embrace the thought of starting over with a clean slate. Folks happily latch onto the thought that the next 365 days are going to be better, happier, healthier, and more prosperous than the previous 12 months. Lots of people make resolutions, deciding with dogged determination that now is when they are going to lose weight, quit smoking, learn a new skill, or change some other aspect of their life. They weren’t interested in making such transformations in April, August, or November…but now all the sudden their going to turn over a new leaf because the calendar says January. We eat foods like pork, cabbage, or black-eyed peas (the food, not the horrible “music” group) because we’ve been told they’ll bring us luck, success, and affluence. I don’t know about y’all, but I’ve been eating that stuff every New Year’s Day my entire life and I’m still poor. 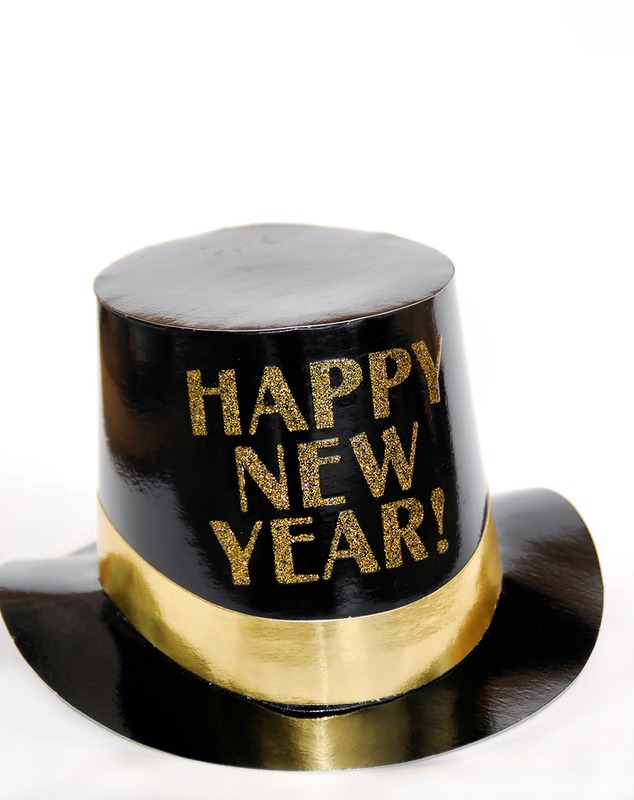 Is there anything wrong with the idea of New Year’s and a new beginning?? Not at all. Just because Jesus was almost certainly born nowhere close to December 25 and that date was simply co-opted by the early church to squash the pagan celebration of Saturnalia doesn’t mean that Christmas is bad. On the contrary…celebrating the birth of Christ is a wonderful idea. Similarly, making January 1st a day of renewal & restoration…a kind of rebirth of our lives…isn’t a bad idea at all. But much like Christmas I think maybe we kind of mistreat New Year’s nowadays. The aforementioned resolutions are too often shallow, vain, meaningless, and broken before the calendar turns to February. 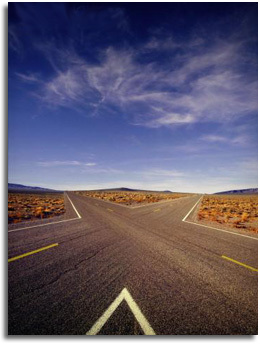 We love to talk about changing & improving our lives, but we aren’t really very committed to following through. We embrace the hope a new year brings, but abandon that hope as soon as things start to go to hell in a handbasket just like last year. Maybe a better idea is to treat every single day as a gift from God and an opportunity to be a better person than we were yesterday. Sammy Hagar sings a song called Give to Live that I absolutely love. In the song The Red Rocker gives the following advice: “If you want love you’ve got to give a little. If you want faith just believe a little. If you want peace turn your cheek a little. If you know what you want just go on out and get it. Don’t give up…don’t give up…don’t give up”. I’ll be the first to admit that I’ve been tempted to give up many times, especially on lonesome days like New Year’s Eve when feeling forgotten, overlooked, and taken for granted. But then I remember that every day is New Year’s Day in some way. Oh sure we are going to have bad days. We are going to fail, screw up, not feel well, and come face to face with the abyss. But, as Tom Hanks says in Cast Away (#40 on my Favorite Movies list), we’ve “got to keep breathing because tomorrow the sun will rise and who knows what the tide could bring”. And hey…maybe I’ll have a date next New Year’s Eve!! Hey Sam, I’ve been “dateless” on New Year’s Eve myself for the past six years or so, and on various years all my life. It used to be more melancholy fr me but I guess now I’m okay with it. It’s true I’ve had girlfriends (even a wife) but that means I’ve experienced just as many downs as ups – relationships tend to make life either really good or godawful bad. I think I’m appreciating the stability of singleness. If I do feel sad or lonely at times, I remind myself that it’s okay to feel that way for a while, and of course I tell God about it, but I also try to thank Him at the same time for various good things I have, and somehow thanking God when I’m sad helps to life me up. And it’s true for both of us – who knows what God will bring about tomorrow or next month or somewhere down the road (cue Barry Mannilow). I like that Hagar song too. By the way, my understanding is that Christian holidays weren’t really designed to quash the pagan celebrations, but to give Christians some reason to celebrate at the same time. Hope your 2012 unfolds with many good surprises!